It has been a while since I sat down and wrote a review on here! I am in full wedding planning mode! Our big day is July 13th! 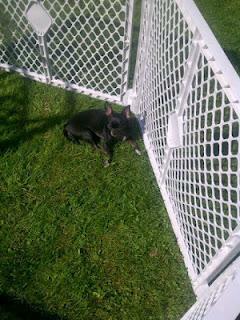 And our little Baby F...turns 1 year old in less than 2 weeks! I have been so busy with everything and trying to enjoy my last few weeks of Maternity leave I really have slacked off on the blogging. I decided to do a review about a product we have purchased since the big move! The North States Superyard Play Yard. I wish that we would have invested in one of these right from the start...The Graco Pack & Play really did not have enough room to keep Baby F happy...but the Superyard Play Yard is 18.5 Square Feet of space and you can also purchase 2 additional panels to make it even bigger. The North States Superyard has been a great purchase! It fold up easy for moving it around...much easier than setting up a Pack & Play. Its great for outdoors, indoors and for pets too so it really is a versatile piece of baby equipment. You could even block off your Christmas tree from pets and kids!! 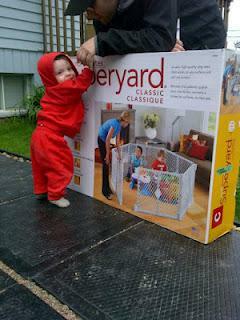 We purchased the Superyard from Sears for $100 plus tax and it was worth every penny. 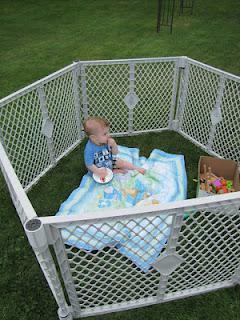 Just my advice...skip on buying a Playpen and just buy a Superyard! You will love it.